(SitNews) - In a surprise move Friday, the Environmental Protection Agency announced that it will withdraw for now its plan to cancel the Obama Administration's proposals to restrict mining in the Bristal Bay fisheries area in Southwest Alaska - home to the world’s most valuable wild salmon fishery. U.S. Environmental Protection Agency (EPA) Administrator Scott Pruitt is following through on his promise to restore the rule of law and process to the previous Obama Administration’s action to restrict mining in Bristol Bay, Alaska. In 2014, the Obama Administration issued what was widely considered a preemptive veto of the Pebble Limited Partnership mining project. This effectively brought the mine’s application process and, due process to a halt. Litigation resulted and continued into this Administration. View of Kaskanak Creek in the Kvichak watershed. The vast amount of aquatic habitat and the complexity of that habitat give a hint into the reasons why these watersheds harbor such large and genetically diverse salmon communities. In May of 2017, Pruitt took the first step to rescind this due process denial and allow the Pebble mine proponents to proceed and progress through the process. EPA received over one million comments from interested stakeholders. Administrator Pruitt’s action allowed the litigation to be resolved and the proponent’s application was allowed to finally move forward. That application is proceeding through the Army Corps’s permitting process. As a result of Pruitt’s actions last summer, proponents of mining in the region were allowed to apply for a permit with the U.S. Army Corps of Engineers. However, after hearing directly from stakeholders and the people of Alaska, EPA is now suspending its process to withdraw those proposed restrictions, and will be leaving them in place while the Agency receives more information on the potential mine’s impact on the region’s world-class fisheries and natural resources. Last week's action is important for several reasons. First, EPA has serious concerns about the impacts of mining activity in the Bristol Bay Watershed. From public comments to community meetings, stakeholders stressed the importance of balancing a singular mine venture with the risk to one of the world’s largest commercial fisheries. Second, for EPA not to express an environmental position at this stage would be disingenuous. Pruitt's decision on Friday willl neither deter nor derail the application process of Pebble Limited Partnership’s proposed project. The project proponents will continue to enjoy the protection of due process and the right to proceed. However, according to the EPA, their permit application must clear a high bar, because EPA believes the risk to Bristol Bay may be unacceptable. EPA intends to solicit additional public comment on the impact of the mining application on the existing proposed determination to better inform that analysis. Murkowski, the Chairman of the Energy and Natural Resources Committee, has worked with EPA to extend the comment period on its proposed withdrawal by 90 days. This was necessary to ensure that all Alaskan stakeholders, including commercial fishermen, would have an opportunity to weigh in. The agency also conducted public meetings in Dillingham and Iliamna in October 2017. Northern Dynasty acknowledged the statement issued by the EPA that indicated the federal agency will continue to support Pebble's due process rights as agreed in the settlement, though the EPA has suspended withdrawal of a pre-emptive regulatory action under CWA 404(c) initiated at Pebble in July 2014. "We expect the permitting process for Pebble to advance expeditiously over the next few years, and that a draft and final EIS will be completed upon which final permitting decisions for the Pebble Project will be made,"said Northern Dynasty President & CEO Ron Thiessen. "Ultimately, we believe the Pebble EIS will describe a project that protects clean water and the world-class fisheries of Bristol Bay, and presents the opportunity for substantial economic benefits for the people of the region and the state. We'd encourage all Alaskans and all interested stakeholders to participate fully in the thorough, objective and rigorous review of the Pebble Project." The tens of millions of salmon that return to Bristol Bay each year fuel a $1.5 billion fishing economy, support 14,000 jobs, and dozens of businesses run by hard-working American families. Northern Dynasty Minerals, a Canadian mining company and principle backer of the Pebble Partnership, has proposed to build a massive open-pit mine that, if built, would be in the headwaters of rivers that supply nearly half of the world’s wild sockeye salmon, and in the heart of some of the world’s most sought-after destinations to fish and hunt. Last July, following settlement of a lawsuit by the proponent of the mine, the EPA proposed to withdraw the 2014 Proposed Determination. During the subsequent public comment period and several hearings in Alaska, EPA received more than one million comments opposing the withdrawal. More than 26,000 Alaskan comments poured in expressing support for protecting Bristol Bay’s salmon and jobs, including dozens of business owners whose livelihoods depend on wild salmon. Following years of extensive scientific analysis and public comment, the 2014 Proposed Determination recommended limiting the amount of mine waste that could be disposed of in rivers and wetlands in the heart of the Bristol Bay region's salmon-producing rivers because of high potential for major harm to fish, drinking water, and recreation, among other things. Sportsmen and women and dozens of Alaskan business owners commend the Environmental Protection Agency for recognizing the overwhelming importance of the Bristol Bay region and its salmon and waters. “Nearly 60 million salmon returned to the rivers of Bristol Bay last year, and fisheries experts are predicting another incredible run this year. It’s good business sense to safeguard this region, which is an irreplaceable Alaskan and American asset. Preserving the Proposed Determination ensures that an important option to safeguard Alaskan families and businesses remains in play,” said Nanci Morris Lyon, owner of Bear Trail Lodge (King Salmon, AK). Under the terms of a May 2017 settlement agreement reached between Northern Dynasty's 100%-owned subsidiary Pebble Limited Partnership and the U.S. EPA, the federal agency agreed it will not advance any action under Section 404(c) of the Clean Water Act until a final EIS for the Pebble Project has been completed – so long as that occurs within four years of the settlement agreement and Pebble files permit applications within 30 months of the settlement agreement. Earlier this month, the Corps accepted as complete a CWA 404 permit application submitted by the Pebble Partnership in December 2017, and has initiated the EIS permitting process. Friday's action by the EPA demonstrates the Agency’s commitment to both the rule of law and process, and upholding the EPA’s core mission of environmental stewardship. The Army Corps of Engineers on January 5, 2018 received a mining permit application from Pebble. 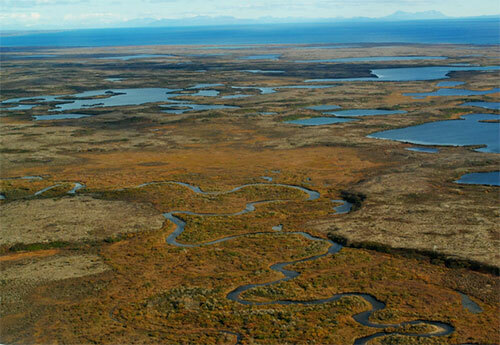 The Pebble Project is located approximately 200 miles southwest of Anchorage in the Bristol Bay region. The deposit lies entirely within the Lake and Peninsula Borough, approximately 23,782 square miles of land which is home to some 1,500 people in 18 communities. The area around Pebble was secured by the State of Alaska during the Cook Inlet Land Exchange of 1974 - a three-way land swap involving the federal government, the State and the Cook Inlet Region Inc. (CIRI), an Alaska Native regional corporation. The State of Alaska secured land including what is now Pebble, for its mineral potential.